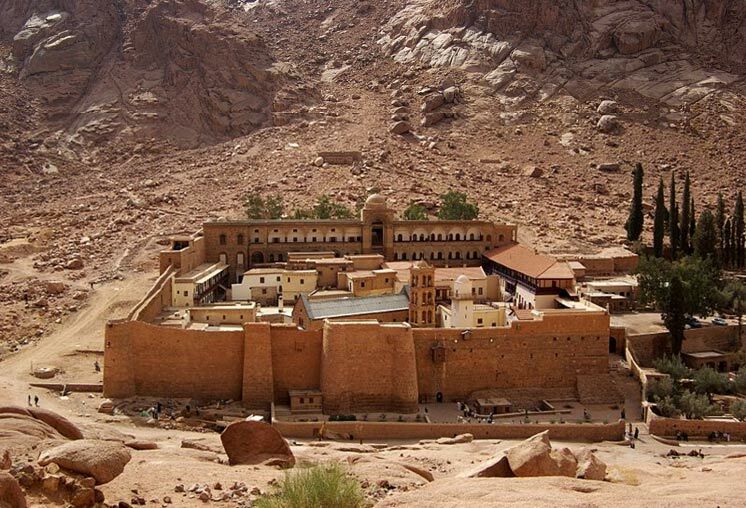 At the foot of Mount Sinai is Saint Catherine’s Monastery, described as ‘the oldest Christian monastery still in use for its initial function’. It is officially known as the Holy Monastery of the God-trodden Mount Sinai. Originally, however, the monastery was called the Monastery of the Transfiguration. This monastery survives today based on an ancient and controversial agreement. Mount Sinai (also known as Mount Horeb) is a mountain in Egypt’s Sinai Peninsula that is sacred to the three Abrahamic faiths due to its association with Moses. In the Old Testament, Moses is said to have received the Tablets of the Law on that mountain. In Islam, this mountain is known as Jebel Musa (meaning Moses’ Mountain’). The story of St. Catherine’s Monastery is said to have begun with the annexation of the Nabataean Kingdom by the Romans during the early 2nd century AD. Under Roman rule, the region declined, and the Sinai region, which became a wilderness, attracted Christian monks who sought to live an ascetic life away from human society. During the first half of the 4th century AD, the Empress Helena, the mother of Constantine, ordered the Chapel of the Burning Bush to be built on the site where Moses saw it's namesake. 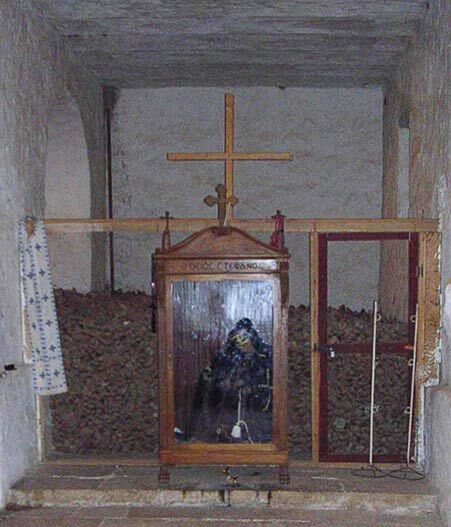 The chapel, which was dedicated to the Virgin Mary, is now considered the holiest part of the monastery. Due to the departure of the Romans in the second half of the 4th century AD, lawlessness descended on the region, and the monastic communities eventually sought the aid of the Byzantine emperor. During the 6th century AD, a fortified wall made of granite blocks was built around the chapel by the Byzantine emperor Justinian I. Apart from protecting the monks, the wall also served to secure the land route from Aqaba to Suez. In addition, the Church of the Transfiguration was commissioned by Justinian, and completed in 560 AD, just before the emperor’s death. As with the Empress Helena, Justinian chose to have this building dedicated to the Virgin Mary. Although initially dedicated to the Virgin Mary, the monastery was later associated with St. Catherine of Alexandria, who was martyred in 307 AD. According to tradition, St. Catherine was ordered by the Roman emperor Maxentius to be severely beaten and tied to a rolling spiked wheel for her refusal to renounce Christianity. When she survived the ordeal, the emperor ordered her to be beheaded. Her body was said to have been miraculously transported by angels to Mount Sinai. During the 10th century AD, the head and hand of the saint were brought to the monastery for safe keeping and became venerated as relics. Other sources assert that the body of the saint was discovered by the monks, and was brought to the monastery. Thus, the monastery became known as St. Catherine’s Monastery, and became a pilgrimage site. In 2017, scientists found languages not used since the “Dark Ages” among ancient manuscripts held at the monastery. There is an international team of 23 world-renowned scholars ‘constantly making new discoveries concerning ancient languages, texts and script styles’ while exploring the documents in the monastery’s library. The library was also re-opened to visitors in 2017 after three years of renovation work. There are thousands of manuscripts at St. Catherine's written in Arabic, Greek, Ethiopian, Coptic, Armenian, and Syriac languages. The list now includes Caucasian Albanian, which was only known from dispersed stone engravings until now, and Christian Palestinian Aramaic, which became defunct after the 12th century. There are also texts written in Latin that have not yet been fully identified but are ‘sometimes in very early scripts’. During the 7th century AD, the new faith of Islam had emerged in the Arabian Peninsula. The Arab conquest eventually brought an end to Christianity in the Sinai Peninsula. In addition, by the early 9th century AD, the number of monks in the monastery is said to have been reduced to 30. Nevertheless, the monastery persevered. According to tradition, the monks at St. Catherine’s Monastery had requested the protection of the Prophet Muhammad himself. The Prophet, who is said to have regarded Christians as brothers in faith, accepted their request favorably. 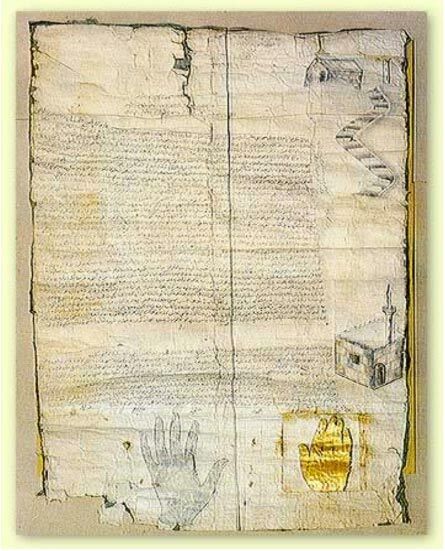 A controversial document, known as the Actiname (‘Holy Testament’) was signed by the Prophet himself in 623 AD. According to this document, the monks of St. Catherine’s Monastery were granted exemption from taxes and military service. Additionally, Muslims were called upon to protect the monastery and provide the monks with every help. As a gesture of reciprocity, during the Fatimid period, the monks allowed the conversion of a crusader church within the monastery walls into a mosque. Despite the perseverance of the past, recent political instability in Egypt has had a terrible impact on the monastery. In 2013, the monastery was ordered to shut down due to the deteriorating security situation in the country. As the monastery is a popular tourist attraction, tourism has become the main source of income for surrounding communities. With the closure of the monastery, the livelihood of these communities has also been drastically affected. This place was a well oiled tourist trap, the mountain associated with Moses is situated across the gulf in Saudi Arabia this has been documented and exposed. جبل كاثرين‎‎, Gabal Katrine; highest Mountain in Egypt.